This guide is written for anyone who has purchased a used flying quadcopter, or a new ARF quadcopter from a “discount” source. We would define a “discount” source as any manufacturer who is selling ARF quadcopters for under $300. Why Am I Inspecting My Brand New Drone? Most Americans have come to expect a certain level of perfection with “new” consumer goods. Unfortunately, when it comes to purchasing low-cost quadcopters from overseas, this expectation is a bit naive. The complexity of these little devices combined with the extremely low margins at which they are sold means that the manufacturers generally do not have quality control departments checking the quadcopters before they are shipped to consumers. 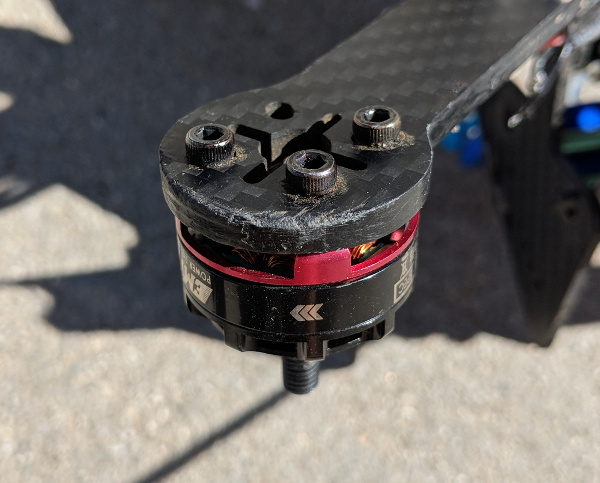 Fortunately, with a little bit of patience, you can catch most problems that are typically seen with ARF quadcopters before they actually cause a crash or any other damage. 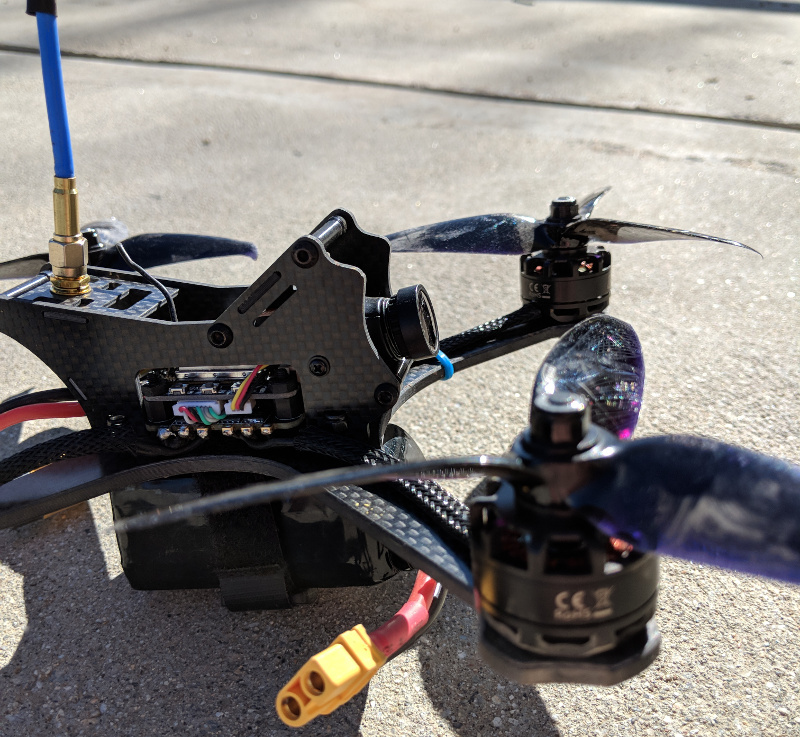 That’s what this guide is about: at Propwashed, we’ve collectively tested a large fleet of ARF quadcopters and have put together a list of things to check for before your first flight. Check the carbon fiber on your frame for burrs or imperfections. 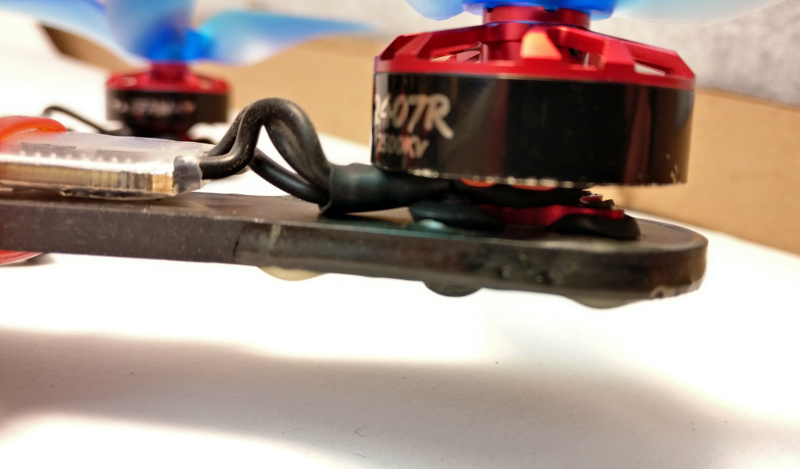 These kinds of problems are rather benign to start with, but can escalate into delamination of the carbon fiber which will compromise the frame’s strength and can hurt you when you handle your quadcopter. Scuffs and burrs on carbon fiber can compromise strength and cut you. Burrs should be sanded off if they are small. You should apply superglue or epoxy to big burrs or fraying to prevent further delamination. You might also consider contacting the retailer for a refund in these cases. Inspect soldering joints for cold soldering. This is where the blob of solder appears grey and the wire doesn’t appear attached to the pad. In extreme cases, you will be able to pull the joint apart with your hands or easily bend it. These types of joints will work for the first few flights, but will fail in quick order — often causing a crash. Here are what some common soldering problems look like. Image courtesy of Adafruit. Follow all wires from one connection point to another. Look for places where they might get pinched against the carbon fiber frame or underneath screws or standoffs. A telltale sign of this is wires that have missing sheathing in places. You will need to repair wires that look like this by desoldering them and adding heat shrink. You can also use electrical tape, but this will generally degrade and fall apart within a few flights. This was found on an ARF quadcopter. The wire was damaged by a plastic standoff being tightened over it. Motors are a common failure point for miniquads. This is because they are the only parts that actually move, so seemingly small mistakes can quickly become problematic. First, check the motor mounting screws. There should be at least 3 screws per motor. All motors should have the same number of screws. Check that all screws are tight. Check where the screws protrude through the bottomside of the motor. The nubs of the screws should not touch any of the wires inside of the motors. Pay special attention to mounting screws of motors. They are metal and often sharp, and will damage anything they contact. The screws on this motor were digging into the motor wires and causing electrical problems. Next, check that the motor is properly assembled by looking at the bottom of each motor. There should be an exposed opening in the quadcopter arm that lets you see the motor shaft. The motor shaft rotates when you spin the motor with your hands. This shaft should be retained on the motor by a c-clip or a screw. If there is a screw, check that it is tight. Pull on the propeller or the prop bolt and make sure the motor doesn’t come apart. Now, firmly grab the motor bell (the part of the motor that rotates along with the shaft). Firmly wiggle it back and forth. There should be no play whatsoever (other than rotation). If there is, your motor will generate lots of vibration and will fail early. Find your video transmitter. 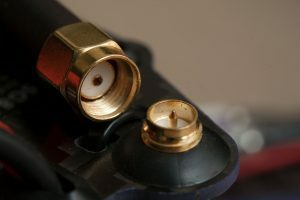 It will be attached to a large golden plug called an “SMA connector”. Follow the cable connecting that plug to the video transmitter and verify it does not get pinched or bent to a very small angle. These types of cables can be damaged by pinching. The coaxial cable is silver in this quadcopter. All bends should be nice and curved – no pinches! There are two types of SMA connectors — RP-SMA and SMA. The difference between the two is which side has a pin on the inside of the connector and which one has a socket for that pin. If you purchased an aftermarket antenna, visually check that it matches the SMA connector type used by your video transmitter. Two female connectors of the opposite type can be screwed together, but will make no contact. This will destroy your video transmitter. Make sure your quadcopter’s antenna connector has at least 4 threads showing. Check that camera is secure in frame. You should be able to tilt it on most frames, but the tilt action should be firm. Take the oppurtunity now to set the tilt to a reasonable angle. Anything less than 15 degrees for your first flight is a good idea. For absolute beginners, level with the quadcopter frame is your best bet. You want your FPV camera to be level for the first few flights. FPV camera lenses can be screwed out for replacement and adjustment. They are locked in place with a plastic lock washer which can break. Check for this by lightly twisting the camera lens left and right. It should not move. This is one of the more important checks. Install your props on your quadcopter. You don’t have to tighten them down. Rotate each prop through a full rotation and note any components on your quadcopter that come close to touching any of the blades. If something can touch the blades, they almost certainly will in a crash. Secure everything that makes you nervous with zip ties. Pay special attention to battery leads and RC antenna wires. While we’re talking about props – check them out. Look closely at the blades for cracks or other types of damage that might compromise their strength. Look at the blades from the side to see if any are pointing up or down relative to the others. These types of problems are especially prevalent in small quadcopters, where the prop manufacturers haven’t really figured out how to make good-quality props yet. 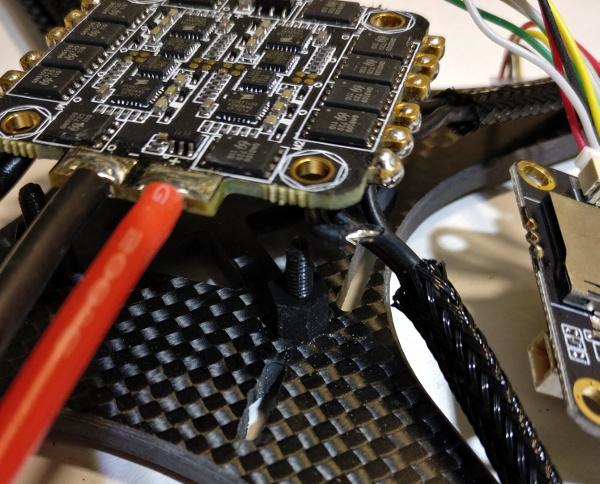 Most ARF quadcopters come from the factory with a velcro strap as the only provision for securing the battery. This will do the job well enough for flying but with racing quadcopters you always need to consider what will happen in a crash. 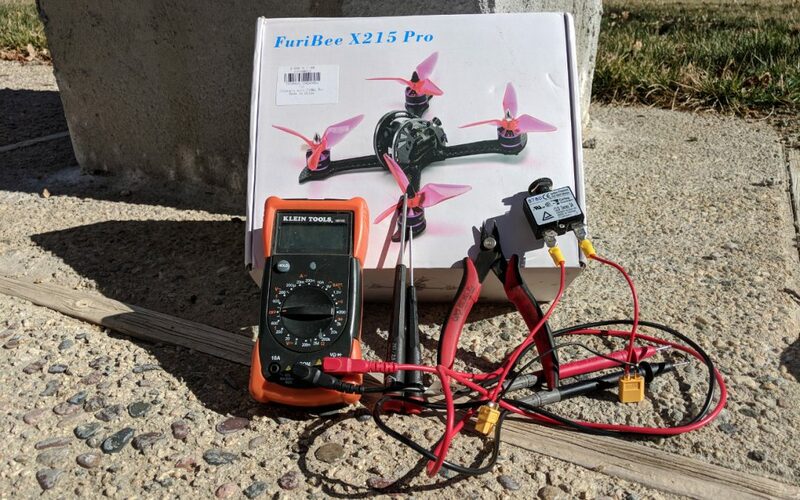 The battery is the heaviest single part of your quadcopter and if it is not properly secured, it will fly off into the weeds – often damaging your flight stack as it tears itself loose. Prevent this by purchasing after-market velcro straps with a rubberized side which significantly ups the friction against the battery. Another option is to purchase velcro tape from your local hardware supply store; apply one side of the velcro to the quadcopter and the other to the battery. 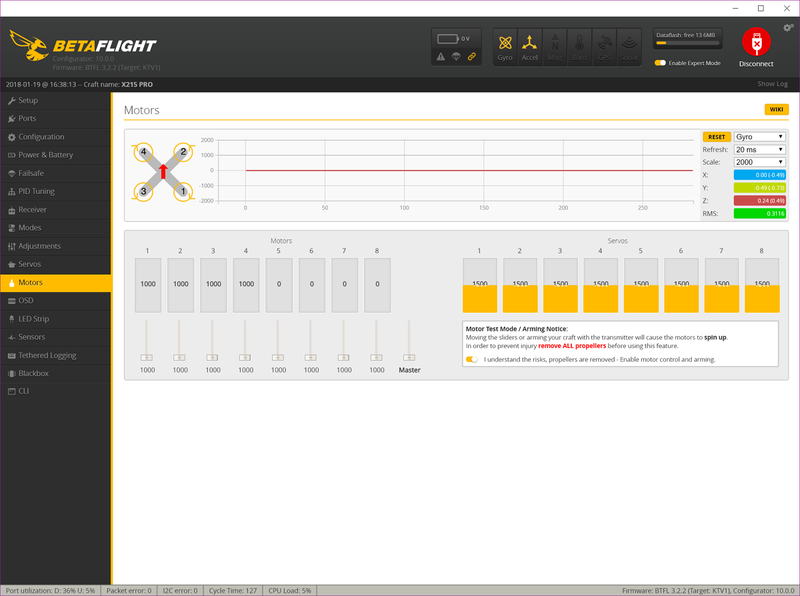 Even if you are planning on flying your quadcopter without updating the firmware, it will pay dividends to plug it into Betaflight Configurator and do a little bit of investigation before you go to your local field. 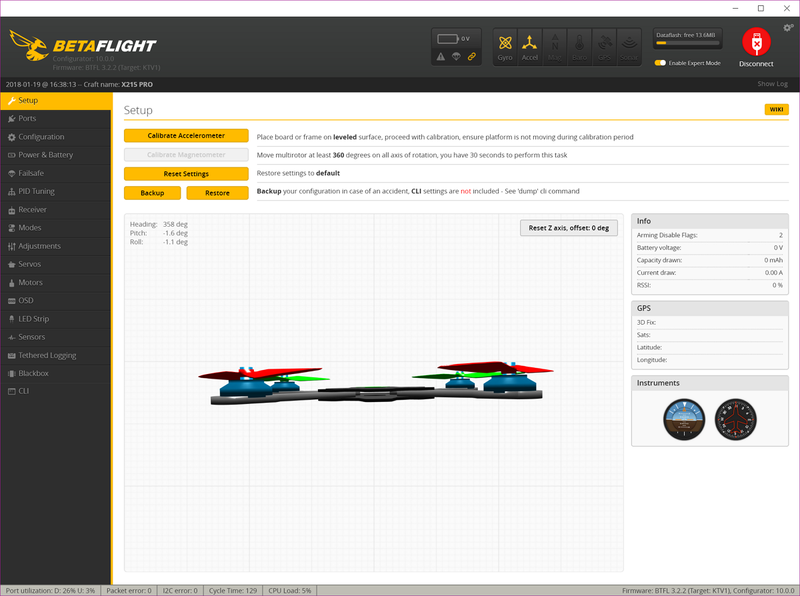 Before you make any changes to anything, though, make a back-up of the Flight Controller settings! ARF quadcopter “factory settings” are rarely available to the public so you need to make sure you have your own set for your quadcopter. 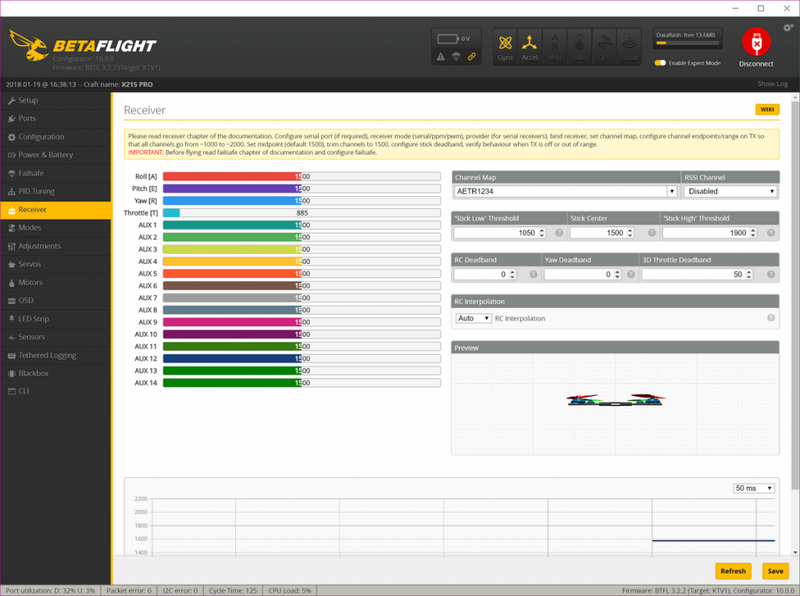 We have a full guide on Betaflight backup and restores – check it out! Once you’ve got a backup, lets power the quadcopter up with the battery. Take your props off. Install your video transmitter antenna. Many ARF quadcopters are flight tested at the factory they are built. If yours has not been flight tested, or you do not know if it has been, consider using a smoke stopper when you first plug it in. This will prevent most wiring problems from destroying the entire quadcopter or causing an electrical fire. While in this screen, tilt your quad left, right, forward and back. Does the 3D quad follow your movements? If not, you will need to adjust the “Board and Sensor Alignment” in the Configuration tab. Now, go to the Motors tab. Use the sliders to spin up each motor. Does motor 1 spin up the correct motor? (right rear) Does it spin in the correct direction per the diagram of the quadcopter? You can place your fingers over the spinning motors to help determine which direction they are spinning. Repeat this inspection for motors 2-4. Turn on your RC transmitter. Go to the Receiver tab. Wiggle all of your sticks (and test your arm switch). The slider values in this tab should move with your sticks. Furthermore, “roll” should move with the roll stick, and the same with the other sticks. If the wrong sliders are moving, you will need to change your “Channel Map”. The correct setting is “AETR1234” for most RC systems. If you are having problems with this, check out our guide on RC receiver problems. Once you’ve done any configuration in software and you are ready to fly, take your quadcopter outside and put it on the ground. Turn on your transmitter and don your goggles. Finally, turn on your FPV goggles or video monitor. Check out video feed. Is video crisp and clear? Blurred image probably means the focus of the FPV camera is off. Screw the lens of the FPV camera in or out to get the correct focus. Walk a good distance away from your quadcopter and make sure that you can still control it by flipping the arm switch on and off. Check that you still have a video feed. Problems here indicate an issue with the antennas. It may also indicate that the transmission power on your VTX is set too low. That about does it for issues we’ve seen with ARF quadcopters. Hopefully you didn’t find any issues, but if you did, now is the time to fix them. You might also consider contacting the manufacturer to see if you can get a partial refund or replacement part, depending on how bad the problems you found were. Assuming everything passed muster, though: it’s time to fly! If we might offer one more suggestion, though: don’t trust your the battery indications on your quadcopter’s OSD for the first flight. Land early, after 2 or 3 minutes max and re-charge your battery. Note how much charge you put back into the battery compared to what your OSD said you consumed (if it has that capability). Running LiPo’s until the quadcopter falls out of the air is a good way to damage them. Did we miss anything that you have found on your ARF quadcopters? Please, drop us a comment below so we can add it to this article!